The interesting thing is that you meet this character before you ever knew him on the television series and the other movies, so sort of what you know about him and then also an exploration of how he got to that point. All of the characters, not just Spock. There’s also news of another former Star Trek cast member appearing on television next season. John Billingsley, who played Phlox on Star Trek: Voyager and appeared in The Nine last season, will have a role on 24 next season. Ain’t It Cool News has rumors on the plot of the upcoming Star Trek movie. Keep in mind that this rumor may or may not be valid, and even if accurate might not apply to the final movie. 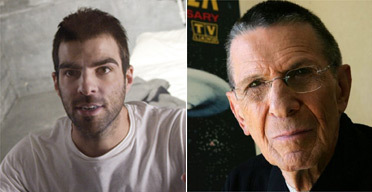 This idea does allow Abrams to work in both the young and older Spock, as well as get around potential continuity problems. Reportedly Romulans wind up in the past and decide to change the time line by killing a young James T. Kirk. The older Spock goes back in time to prevent this plot, however might wind up creating a different time line. Subsequent movies would take place in this new time line in which many things would be the same but there could be differences. Unless Abrams has some remarkable ideas for this new time line (assuming there is even any truth to this) I’m not sure this is a good idea. There are plenty of stories which could still be told without violating the continuity of the original stories. Of course fans might have to give Abrams a little leeway and not worry about every trivial point. Another story reports on possible energy weapons which could be developed to use against insurgents in Iraq. Posted in Science, Science Fiction, Television. Tags: Grand Hotel, Iraq, Science Fiction, Star Trek, Zachary Quinto. RSS feed for comments on this post.. TrackBack URL.